This 14-inch, 56-volt, battery-powered chain saw from EGO weighs 14 lbs. It has a chain brake, a tool-less bar adjuster, and a 5-year warranty. 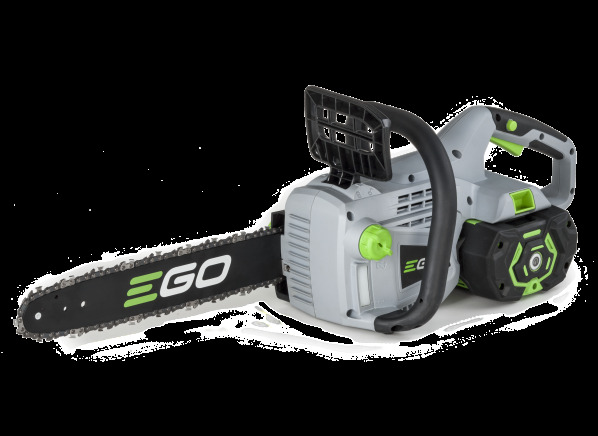 The EGO CS1401 is part of the Chain saw test program at Consumer Reports. In our lab tests, Chain saw models like the CS1401 are rated on multiple criteria, such as those listed below. Cutting speed: How fast a saw cut through a 10-inch-square oak beam. Safety: Consists of kickback intensity, the potential for burn due to inadvertent contact with the muffler, and storage safety--how well protected the cutting chain is from accidental contact during storage. Ease of use: Based on engine-starting convenience (the average number of pulls to start), primer and choke location and operation, and the ease of adjusting the cutting chain’s tightness, checking and adding fluids, and accessing the air filter and spark plug. Chain brake Chain brake This brake stops the chain almost instantly and either engages when the handguard is contacted or activates automatically via an inertial system. Anti-vibration Anti-vibration Rubber bushings or metal springs between the handle and the engine, bar, and chain that minimize vibration and user fatigue. Tool-free chain adjuster Tool-free chain adjuster A hand-operated wheel-and-crank mechanism that unlocks and locks the chain bar and moves it in and out, letting you adjust chain tension without loosening adjustment nuts or turning adjustment screws. Translucent oil tank Translucent oil tank Lets you easily check the bar-oil reservoir. Metal bucking spikes Metal bucking spikes Comes with metal bucking spikes that help with cutting stability. Storage case Storage case Indicates that the model comes with a case for storage. Protective sheath Protective sheath Comes with a protective sheath that covers the blade. Extra chain Extra chain Comes with an extra chain. Warranty (yrs.) Warranty The length of time the saw is covered by its manufacturer for defects or repairs.